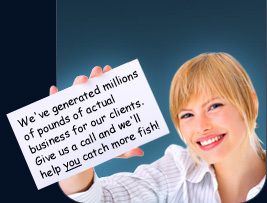 Designfish Studio Eastbourne Web Design has been trading for ten years. We have designed websites for celebrities, members of parliament, supermarkets and large international corporations. Most of our web design clients are small, as are our web design charges. We also specialise in Search Engine Optimisation and new busniess generation. The majority of our web design clients are small companies, like us. And we specialise in providing cost effective easy to use ecommerce or updatable CMS websites. We also specialise in Search Engine Optimisation, new business generation, Google, business process engineering, streamlining and analytics. We can help turn a website with an average level of performance into a more sophisticated and successful marketing product. If you are looking for a managed or promoted website package, by and experienced web designer which involves the development and marketing of a website and the design and support of a web designer in Eastbourne or established web design company in Eastbourne, Hastings or East sussex, who can support your business in the months and years ahead, contact us today. Our web design company serves clients nationally across the UK, from Eastbourne, East Sussex, between Brighton and Hastings in East Sussex. The vast majority of our web design clients are not based in Eastbourne, Hastings, Brighton or East Sussex. Its far more important to partner with a reputable web design company with merit and finess, than simply jump into bed with the local web designer, for the sake of geographic convenience. Whether or not you were seeking a web designer in Eastbourne, Brighton, Hastings or East Sussex, we look forward to receiving your enquiry. If you are a web partner, contact us to add url, submit site, add or swap links on our links page.